Apprximately 29,641 new jobs are expected to be created in the Malaysian automotive industry in 2018, according to a statement by the Ministry of International Trade and Industry (MITI). 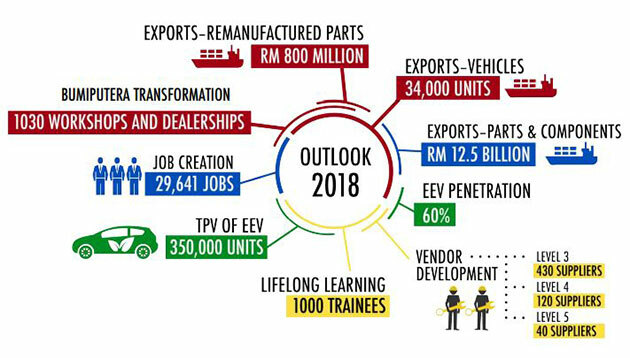 MITI stated that the industry has demonstrated continuous holistic growth, with 27,125 new jobs created as at December last year, since the National Automotive Policy (NAP2014) was announced in 2014. The number of new jobs created at the end of 2017 was a 4.93% increase from the 25,850 recorded in 2016. In addition, 31% of the jobs created thus far were for skilled and highly skilled workers, such as technicians, executives, engineers and designers. The statement noted that these figures signify the increasing perception that the automotive industry is a career sector of choice for graduates. Speaking at the Updates on the Automotive Industry 2017 and Outlook in 2018 on January 18, Minister of International Trade and Industry, Dato’ Sri Mustapa Mohamad, said that the vastness of this industry requires a holistic outlook, one that considers the impact of high value employment and business opportunities. In addition, the ministry shared that several MAI programmes have also added to the increase in business productivity and growth, such as the MAI Lean Production System (LPS) and the Automotive Supplier Excellence Programme (ASEP), MAI Industry 4.0 Developmental programme.